Are light beers coming back into fashion in the US? While craft has revolutionised the American beer market in recent years, it seems the US is a country of light beer drinkers. For example, the sharp decline of Budweiser sales means light beers – for the first time ever – now make up the top three selling beers in the country: Bud Light, Coors Light and now Miller Lite, according to data in The Washington Post. The top three light beers are all suffering long-term sales decline, but the rapid rise of Michelob Ultra (which AB InBev admits is cannabalising Bud Light) suggests light beer still has growth prospects. In fact, there is opportunity for craft beers to tap more into the huge light beer market. For example, craft brewer Firestone Walker has enjoyed huge success with 805, its lightly hopped, 4.7% ABV lighter ‘blonde ale’ capturing a new, more mainstream drinker despite craft fans decrying it as ‘dumbed down’. Most American beer drinkers still find mild-tasting, lower alcohol beers the tastiest. Mintel Purchase Intelligence shows that US beer buyers are more likely to say retail launches of light beers are ‘tasty’ compared to beer launches overall, highlighting the fact that despite all of craft beer’s headline-grabbing growth, it still accounts for just 12.3% of US beer volume sales, according to Brewers Association. In fact, only 29% of US beer drinkers drink ‘true-craft’ beer (eg Dogfish Head), according to Mintel’s US report on beer. One of the major reasons why beer drinkers prefer the taste of light beers is refreshment: 68% of beer buyers perceive light beer launches as ‘refreshing’ compared to 54% for all beer launches. While consumers are more likely to be motivated to drink for taste than refreshment, refreshment has always been a key driver of beer consumption in the US, especially in summer months. 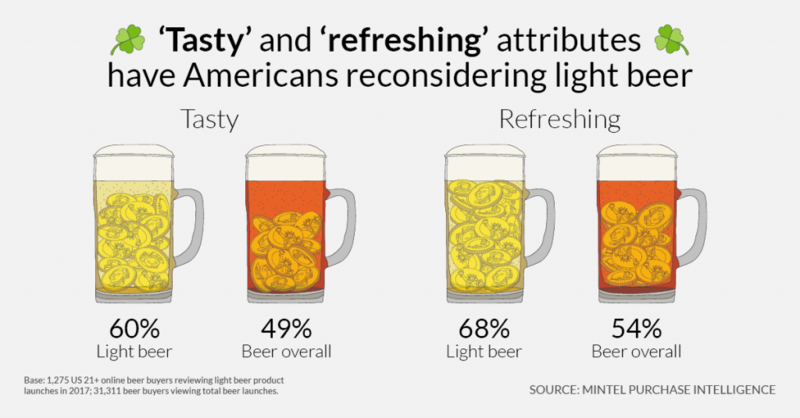 What’s more, Mintel Purchase Intelligence finds the light beers perceived as tastiest were also rated most refreshing. While beer buyers perceive light beers as superior to all beers on two of the three main purchase drivers of ‘tasty’ and ‘good value’, ‘exciting’ is the only top three trait where light beers are not seen as better. Light beers are brewed deliberately not to be too exciting but this suggests more exciting innovation could help dial up light beer sales. What exactly does ‘exciting’ mean to beer buyers? The two light beer brands considered the most exciting are Coors Light Little Silver Bullets in 8 oz. cans and Heineken Light, which was reformulated in 2015 and is a two-time award winner of the World Beer Championships. US beer buyers liked the smaller packaging of the Coors launch (‘convenient to have a smaller can’; ‘convenient for road trips etc’. ), while Heineken Light was considered ‘exciting’ because of Heineken’s strong brand equity as a premium import. Another big selling point for light beers is low calories, but only a fifth of US beer drinkers claim that low calories is an important factor in choosing a beer. Mintel Purchase Intelligence also shows that calories is a secondary purchase influencer: US beer buyers view ‘indulgent treat’ as only a moderate driver of light beer purchase. Brands are therefore better off talking up taste credentials first and low calories second. Low calorie may not overtly attract drinkers to a beer brand, but high calories do risk alienating existing drinkers as 24% of US beer drinkers claim to be drinking less beer in 2017, with two in five of these consumers blaming calories.